"This thing is built like a Mercedes-Benz..." We've probably all heard someone use that sentence to describe a lesser car. If the person using that phrase actually knows a thing or two about Mercedes-Benz cars, he's probably thinking of a W124 car. When introduced in 1985 there was nothing on the market that came close to the build quality, fit & finish and innovations found on the W124. It was an engineering masterpiece. But, like all cars, as the W124s get older, problems start to appear. The two biggest, most common problems are the head gasket and wiring harness. The head gasket is a pretty straight forward job. It has been redesigned and once replaced, will last a very long time. The wiring harness issue is a case of good intentions gone wrong. It is an earth friendly, biodegradable harness. The problem is, it starts to biodegrade in the car, long before the rest of the car is ready for the junkyard. Upgraded harnesses are available and, with some basic automotive knowledge and tools, the repair can be done in a home garage. If you do an online search, you will find some tips on how to repair the original harness. Some people seem to have had some success doing that, but personally, I would just replace it and be done with it. Another issue is the pump that controls the self leveling suspension. Some seem to last forever, some eventually fail. In some cases, these can be repaired relatively cheaply. All of the above sounds scary, right? It shouldn't. Once the car is sorted and the problem components replaced, you have a classic car that can be used everyday. It will be as reliable as a newer Honda, and cost half as much. Best of all, instead of saying "This car is built like a Mercedes-Benz," you can say "This car is a Mercedes-Benz." This car has had all of the problem parts replaced. The body and interior look like new. It has 163,000 miles on it and it would be very easy to double that mileage before having to do any major work. Parts for these cars are not cheap (especially from the dealers), but they are readily available. There are a number of clubs and forums out there that can help you if a problem arises. 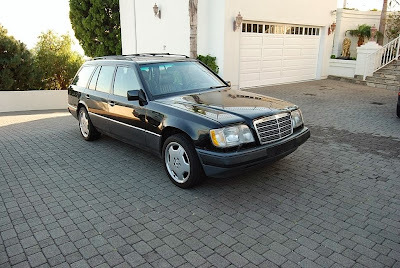 This car is priced at the very upper end of the older W124 price scale. Given the condition it's in and the work that's been done, it is most likely worth it. Located in Malibu, CA, click here to see the eBay listing. The AC evaporator is also a costly repair. This looks like a nice wagon. The monoblocs look cool, but weigh a ton. These are the last Mercedes that you can work on with hand tools.